This is the latest accepted revision, reviewed on 23 April 2019. "High school" redirects here. For other uses, see High school (disambiguation). A secondary school is both an organization that provides secondary education and the building where this takes place. Some secondary schools can provide both lower secondary education and upper secondary education (levels 2 and 3 of the ISCED scale), but these can also be provided in separate schools, as in the American middle and high school system. Secondary schools typically follow on from primary schools and lead into vocational and tertiary education. Attendance is compulsory in most countries for students between the ages of 11 and 16. The organisations, buildings, and terminology are more or less unique in each country. 0 Early childhood Education (02 Pre-primary education) Education designed to support early development in preparation for participation in school and society. Programmes designed for children from age 3 to the start of primary education. Level 0: Pre-primary education. 1 Primary education Programmes typically designed to provide students with fundamental skills in reading, writing and mathematics and to establish a solid foundation for learning. Level 1: Primary education or first stage of basic education. 5 Short-cycle tertiary education Short first tertiary programmes that are typically practically based, occupationally specific and prepare for labour market entry. These programmes may also provide a pathway to other tertiary programmes. Level 5B: First stage of tertiary education: typically shorter, more practical/technical/occupationally specific programmes leading to professional qualifications. Each country will have a different education system and priorities. Schools need to accommodate students, staff, storage, mechanical and electrical systems, storage, support staff, ancillary staff and administration. The number of rooms required can be determined from the predicted roll of the school and the area needed. According to standards used in the United Kingdom, a general classroom for 30 students needs to be 55 m², or more generously 62 m². A general art room for 30 students needs to be 83 m², but 104 m² for 3D textile work. A drama studio or a specialist science laboratory for 30 needs to be 90 m². Examples are given on how this can be configured for a 1,200 place secondary (practical specialism). and 1,850 place secondary school. The first taxpayer-funded public school in the United States was in Dedham. computer rooms or media centres. Government accountants having read the advice then publish minimum guidelines on schools. These enable environmental modelling and establishing building costs. Future design plans are audited to ensure that these standards are met but not exceeded. Government ministries continue to press for the 'minimum' space and cost standards to be reduced. A secondary school locally may be called high school or senior high school. 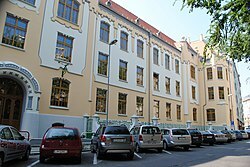 In some countries there are two phases to secondary education (ISCED 2) and (ISCED 3), here the junior high school, intermediate school, lower secondary school, or middle school occurs between the primary school (ISCED 1) and high school. Iceland: framhaldsskóli (menntaskóli, iðnskóli, fjölbrautaskóli) from 11-13 Grade. You go first in 1 - 10 Grade then you change the school to Menntaskóla and take 3 years (11-13 Grade). But you can also take it 4 years. Japan: chūgakkō (中学校; literally middle school), kōtōgakkō (高等学校; literally high school), chūtōkyōikugakkō (中等教育学校; Secondary School) – In the pre-Meiji educational system, the equivalent was called "chūsei"
Taiwan: Junior High School (國民中學), Senior High School (高級中學), Vocational High School (高級職業中學), Military School (軍校), and Complete High School (完全中學). United States: High school (North America) (usually grades 9–12 but sometimes 10–12, it is also called senior high school) is always considered secondary education; junior high school or intermediate school or middle school (6–8, 7–8, 6–9, 7–9, or other variations) are sometimes considered secondary education. ^ "International Standard Classification of EducationI S C E D 1997". www.unesco.org. Archived from the original on 2017-03-19. Retrieved 2017-03-12. ^ Iwamoto, Wataru (2005). "Towards a Convergence of Knowledge Acquisition and Skills Development" (PDF). uis.unesco.org. UNESCO. Archived (PDF) from the original on 2017-05-25. Retrieved 11 March 2017. ^ "International Standard Classification of Education 2011" (PDF). Archived (PDF) from the original on 2017-12-15. Retrieved 25 December 2017. ^ a b c Ward, Ken. "British and American Systems (Grades)". trans4mind.com. Archived from the original on 2017-03-31. Retrieved 30 March 2017. ^ Liew Kok-Pun, Michael (1981). "Design of secondary schools:Singapore a case study" (PDF). Educational Building reports. Voume 17: UNESCO. p. 37. Archived (PDF) from the original on 2017-04-04. Retrieved 3 April 2017. ^ "Baseline designs: 1,200 place secondary (practical specialism) - GOV.UK". www.gov.uk. GOV.UK. Archived from the original on 2017-04-05. Retrieved 4 April 2017. ^ "Baseline design: 1,850 place secondary school - GOV.UK". www.gov.uk. gov.uk. Archived from the original on 2017-04-05. Retrieved 4 April 2017. ^ a b "Guidelines relating to planning for public school infrastructure". Department of Basic Education, Republic of South Africa. 2012. Archived from the original on 2015-09-07. Retrieved 3 April 2017. ^ "Baseline designs for schools: guidance - GOV.UK". www.gov.uk. Education Funding Agency. 11 March 2014. Archived from the original on 2017-04-04. Retrieved 3 April 2017. Wikimedia Commons has media related to High schools and secondary schools.